Unit Testing: Testing the smallest possible unit of code and mocking everything else. This such as help libraries, utilities, and business logic should be 100% unit tested. Other types of testing such as Integration or End-to-End tests should probably live in separate projects, but that your decision and is outside the scope of basic Thunderball testing. A test should be isolated as much as possible. Avoid dependencies such as environment settings, register values, or databases. A test should independent and not depend on running other tests before it, nor should it be affected by the order of execution of other tests. A test should be deterministic. Running the same unit test 1,000 times should return the same result every time. Each test should be singular. Try to keep the number of expect calls in a test as close to 1 as possible. Tests should be readable and easy to understand. Tests help serve as documentation. Don&apos;t only test positive results, but also test edge cases or bad values as well. Be sure to test for null and undefined. If you throw any exceptions, make sure you test that those exceptions get thrown when the correct conditions are met. Colocate tests with the code that&apos;s being tested. Tests should live close as possible to to code instead of some global tests folder. Enzyme: A testing library specifically for React that makes it easier to assert, manipulate, and traverse your React Component output. It&apos;s meant to be intuitive and flexible by mimicking jQuery&apos;s API for DOM manipulation and traversal. All Tests must live in a folder named __test__. This folder should live as close as possible to the files being tested. 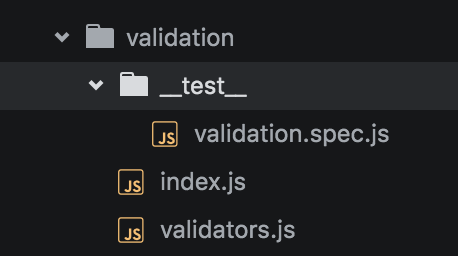 Test files themselves should follow the **FILENAME.spec.js** format where FILENAME is the name of the file or component being tested.